Managing equestrian facilities requires special attention to the little details that will ensure the safety and well being of the facility's equine inhabitants, boarders and visiters. While it may be convenient to have trailers near the stables to load or unload equipment and horses, it is not necessary or desirable to store them there. The same is true for tractors, mowers, and arena maintenance equipment. Another huge issue in managing equestrian facilities is what to do with the "by-products" of horse ownership. Many horses spend a significant portion of their day in stalls, accumulating large amounts of manure and stall waste. Efficient manure removal and disposal is crucial. 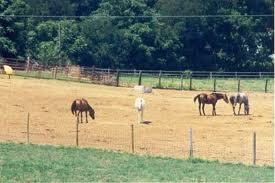 4) improper containment for unexpected loose horses. A loose horse should not be able to reach the public roadway or stable parking area. If you do not have an adequate perimeter fence and/or gate system, do not allow inexperienced, underage, or lesson clientele to ride outside of a secured riding ring or area. A simple protocol that dictates leading horses in-hand to the arena can circumvent this managing equestrian facilities issue. Whether the barn is large or small, the guidelines are much the same for the supervision of clientele. Because riding students, especially minors, are often inexperienced, it is the responsibility of the owner/instructor to maintain a safe environment for all users. Since it is common for parents to “drop off” their children for lessons, special provisions must be made to ensure that children are not a danger to themselves or others. Barn visitors love to scratch, pet, and feed horses. Most parents would not allow a child to run up and pet a strange dog but do not hesitate to let the child pet a strange horse. 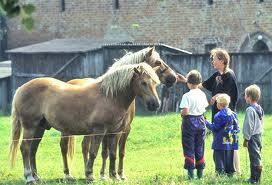 Children have a natural affinity for horses but do not possess the experience to avoid inherently dangerous situations. Therefore, some provision must be made to safely accommodate small children. Children should NEVER be left unattended, and children 6 years of age and under need in-hand supervision. Adult and youth visitors (friends or strangers) must be willing to follow barn rules. 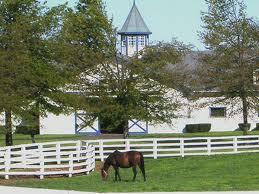 To avoid problems, it is best to keep the horses well apart from the general areas of foot travel. In managing equestrian facilities, visitors and clientele should find it easy to go first to the office where they can sign releases and get a copy of the barn rules before entering the barn area. Unsupervised visitors or guests may act improperly around animals due to ignorance about normal horse instincts and behavior. This may lead to a horse “spook,” bite, or kick of the visitor or clientele (and liability). A general rule of managing equestrian facilities is to provide two to three acres per horse for year-round grazing unless the horses are supplementally fed. Provisions for winter hay feeding will be necessary. Pastures or paddock layout should be planned to accommodate rotation of pastures. Depending upon stocking rate of horses, a pasture rest period can be provided for individual pastures to allow regrowth and recovery from grazing. Most horses benefit from being outside regularly for exercise. Free exercise reduces behavior and respiratory problems, promotes optimal growth and development of young horses, and improves overall horse health. However, if the pasture is to serve as a feed source, other factors need to be considered including its potential nutritional value, carrying capacity or stocking rate, and grazing system design. Dry lots, or sacrifice paddocks, provide an opportunity to move horses off pastures when they are excessively wet or dry, and to avoid overgrazing. 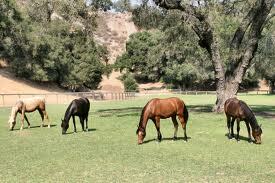 Dry lots can vary in size, however they should provide a minimum of 500 square feet per horse. Gates should be placed away from corners, closest to the direction of travel. Gates should be large enough to get equipment through (i.e. tractors, mowers etc...). 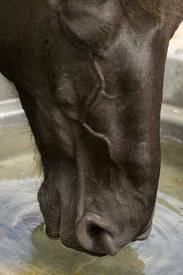 Clean, fresh water is a requirement for horses. Place waterers in areas where filling and cleaning is convenient, and if possible, where multiple pastures have access. Also, insulate outside water tanks to reduce heating costs. Thermostatically-controlled heaters, heat tape and frost proof hydrants will also protect against freezing. To reduce ice build-up, locate a stock tank in a sunny location and protect from northern winds. If the tank freezes over, break the ice daily so the horses can get water as needed. They can not get enough water by eating snow. Remember, management of horse pastures is an ongoing process that takes time, equipment, knowledge, diligence, and money. If managed well, pasture will be an economical source of high-quality forage, as well as a healthy place for horses to exercise. If managed poorly, pastures can become overgrazed, allowing weeds to take over. A poorly managed pasture provides little nutritional value and may contribute to horse health problems.